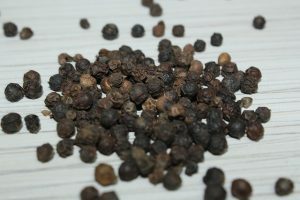 Black Pepper has been prized since ancient times when, in Greece, the spice was used not only as a pungent seasoning but as a currency and a sacred offering. Today pepper is a staple of kitchens around the world. 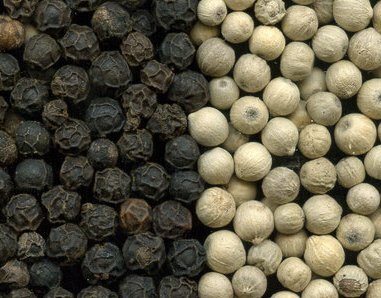 Black and white peppercorns are the same fruit; the difference in their colour reflects varying stages of development and processing methods. Pink peppercorns are derived from a completely different plant species (Schinus molle). Today, the major commercial producers of pepper are India and Indonesia. The berries of the black pepper plant. Black pepper contains manganese, iron, vitamin K, dietary fibre and copper. Helps prevent the formation of intestinal gas. Has an antioxidant and antibacterial effect. Stimulates the metabolism, improves vitality and helps break down fat cells. May have an inhibitory effect on the progression of tumour growth. Black is rarely allergenic, that is, i.e. it is safe when used as a seasoning in food and might be safe for most people when used in medicinal amounts. Do not, however, give young children large amounts of pepper. Consult your medical practitioner before taking black pepper for cancer, or if on a regimen of drugs, including Lithium. * Rub steaks with crushed peppercorns before cooking to create the classic dish, steak au poivre. * Add generously to venison steaks or stews for a depth of flavour. * Use to season salad dressings. Remember that black pepper is best served freshly ground. Buy whole peppercorns instead of powdered black pepper. Piper nigrum flourishes in hot and humid tropical climates. It is not commonly grown in southern Africa.